The multi system operator (MSO) GTPL Hathway has been restrained by the Telecom Disputes Settlement and Appellate Tribunal (TDSAT) from providing signals of Star India channels to Scod18 Networking as well as the local cable operators (LCOs) affiliated to Scod18. The ministry of information and broadcasting (MIB) has sent notices to 92 multi system operators (MSOs) in which the ministry asked them to submit details about their network or face cancellation of registration. As the applicant MSOs sought to know the status of their applications submitted to the ministry for information & broadcasting (MIB) for grant of MSO registration, the ministry said that the issue of pending MSO registration is under consideration. The net profit for Q4 of the multi system operator Hathway Cable and Datacom has come down 47% to Rs 12.6 crore from Rs 23.9 crore in the trailing quarter. Its EBITDA has gone up 6% at Rs 63.9 crore from Rs 60.1 crore. EBITDA margin improved 100 bps to 44% from 43%. 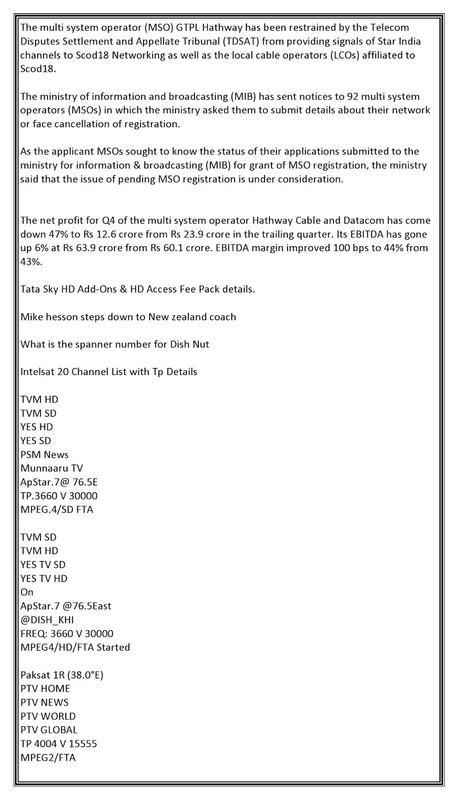 Tata Sky HD Add-Ons & HD Access Fee Pack details.